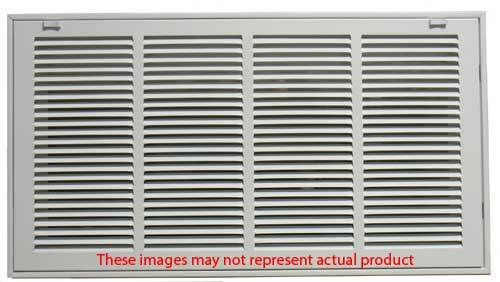 20 X 14 White Steel Return Air Filter Grill Discounts Apply ! Purchase a filter grille such as this one for cleaner air flow from duct work. Remove allergens and dust to get cleaner air flow with this filter grille in both residential and commercial settings. This filter grille installs easily into a duct hole of 20 x 14 inches in ceilings or sidewalls and features a hinged faceplate which opens to allow for quick filter replacement. For cleaner air flow from duct work, the filter works to remove dust particles from the circulated air. This filter grille is constructed of stamped steel and has a bright white painted finish, sealed with clear lacquer coating. Please note that this filter grille frame does not include a filter - this must be purchased separately. Looking for a reusable air filter for your grill? These filters can be cut to any size.